Michel Platini: cometh the hour, cometh the man? Michel Platini must feel at times that heâ€™s swimming against a violent tide. His efforts to force Europeâ€™s top clubs to subscribe to a sustainable financial model continue to be met with a sly resistance and his stance against the introduction of video technology routinely sees him mocked by the international press. Itâ€™s lonely at the top, so they say, and Platiniâ€™s tendency to buck trends makes him an easy target for those in the sport looking to foment the status quo. But fighting the good fight is becoming less straightforward as matters of the heart and of the head muddy the waters and threaten to present some unenviable choices. Platini has been a vocal champion of some noble causes during his presidency at UEFA. In championing the Financial Fair Play legislation he has offered genuine hope that the fantasy football approach to spending at Europeâ€™s power clubs might be brought under control, despite a few teething problems drawing some legitimate criticisms from concerned onlookers. His assault on the unchecked rise of the elite has extended to the pitch too, as his campaign to reduce Champions League representation from the bigger nations builds on 2010â€™s remodelling of the competition draw to favour the less heralded nations. 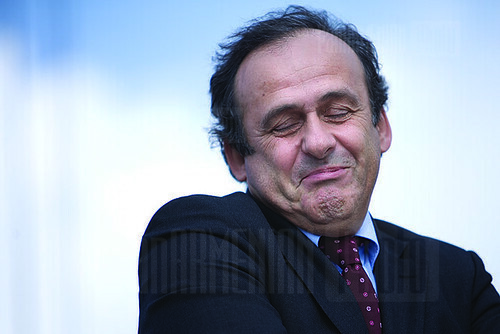 To say Platiniâ€™s heart is with the underdog is to trivialise his intentions. He believes firmly in competitive balance to enable UEFA to meet its responsibilities as a positive role model, and the call for a financial watchdog hardly implies bleeding heart sentimentalism. The demand for a levelling of the playing field bleeds through again in his vehement opposition to goal line technology, the President reluctant to allow money to further drive the top of the game from the rest on his watch. But change is afoot in Europe. Attentions are already turning to the FIFA presidency elections due before 2016 and Platiniâ€™s is the only name being publicly touted with any conviction. But questions present themselves: can UEFA bear to lose Platini just as the new legislation is ready to be implemented? What about the clubs who have shown themselves irrefutably to be in need of some responsible parenting? Can the playground be left unattended the day the inspector comes? And perhaps more pressing, will Platiniâ€™s skills as a leader be harnessed at FIFA, an institution deeply infected by a culture of misinformation and mafia-esque secrecy? However successfully FFP is implemented, European footballâ€™s modernisers must be under no false impression that it represents job done. There is still work to be done to arrest some worrying developments in club football and the stakes are high. Clubs will continue to pick apart the rules that state expenditure must not exceed income generated with elaborately crafted sponsorship agreements and the impact of sugar-daddy investors on club ownership is set inevitably to rise. Platini is nothing if not consistent in his philosophies, and his vision for limiting the influence of big business on the game is commendable in its focus, but one wanders how applicable his policies might be if he is poached by FIFA. The world governing body is after all plagued by an opaque bureaucracy that cuts near to the bone and the momentum for change must come from below as much as from above. In a week when FIFAâ€™s top brass have dismissed an independent commissionâ€™s proposals for a review of its ethics with a patronising calm it doesnâ€™t take a cynic to question just how effective a change of personnel at the top could really be. There is a balance of power to be mindful of at UEFA too. Corrupt as FIFA may or may not be, the record suggests it is at least governed by the personnel who are elected to govern it. Less so on the continent where the big clubs ride roughshod over their nominal masters, a Faustian alliance with the media organisations relegating the leadership to an impotent middle-man, silenced by the tide of commerce whilst the coffers swell. If this sounds deterministic and defeatist as a conclusion, then it is. If Manchester United, the two Spanish clubs and one or two choice others were to pack up and abandon the Champions League in favour of their own European competition thereâ€™s little doubt that theyâ€™d take the TV contracts with them. UEFA may handle all the paperwork but the clubs own the product and as such call all the shots. But what they can do is to try and make life difficult for the reckless money men and Platini is their chief pall-bearer in this respect. The former world player of the year doubtlessly has allies in his mission who would do their best to fill his shoes should he depart for a new challenge at FIFA but whether they could match Platiniâ€™s stubborn resilience is uncertain, and the presidency would surely suffer from losing such a high-profile and globally respected leader. At FIFA the challenges are different and one could argue there is less at stake. Since they donâ€™t control the big club competitions they have a reduced say in the conditions clubs must meet in order to compete and, for all the glitz and glamour of the World Cup, it is the premier club matches that generate the bulk of the global gameâ€™s wealth. Those who long for sporting integrity to trump commercial interests may find their most effective weapon reduced in potency should he make the trip across Zurich. Not that Platini can boast a flawless record when it comes to ethics. He has family connections with the Qatari investment group responsible for the ambitious work going on at Paris St Germain â€“ his son Laurent is overseer of Qatari Sports Investmentsâ€™ European interests â€“ and there have been rumblings that PSG are being allowed to mimic Manchester Cityâ€™s â€˜indirect sponsorshipâ€™ model in exchange for Qatari investment in socially deprived suburbs of Paris. As â€˜dodgy dealsâ€™ go itâ€™s one of the more socially aware youâ€™re likely to see, and it seems almost a microcosm of Platiniâ€™s CV whilst in office that when he does bend the rules itâ€™s with social regeneration in mind. But the point is that for all his good intentions, Platini is flappable when it comes to staying on the straight and narrow, and if there is one place where those failings are likely to be exposed itâ€™s in the rotten boardrooms at FIFA. It could be that there is no issue to discuss. Blatter has at least 3 years until any election is likely and the football landscape is volatile, never more so than at top level governance. The last 2 years have seen some reputable names exposed over wrong-doing and dragged out of the boardroom and through the mud. One can never say what might be lurking in Platiniâ€™s or anybody elseâ€™s closet. But there is a man whose record in government resonates with the thinking of football purists around the world and to see him swallowed up by the FIFA machine of undisguised self-interest would be a loss the club game can scarcely afford. The US take step closer to Brazil but has Klinsmann really changed anything?